We celebrated our sons first birthday at the end of March...last year. It makes sense I'm posting this nine months later, right? I know, I know. It's almost the second birthday. Technically I did begin writing this blog post after his birthday, but the book promotion and talks, followed by writing another zero-waste lifestyle book has amongst other things, taken up some of my writing time. So here it is, better late than never. By the way, we did create rubbish....more than anticipated. 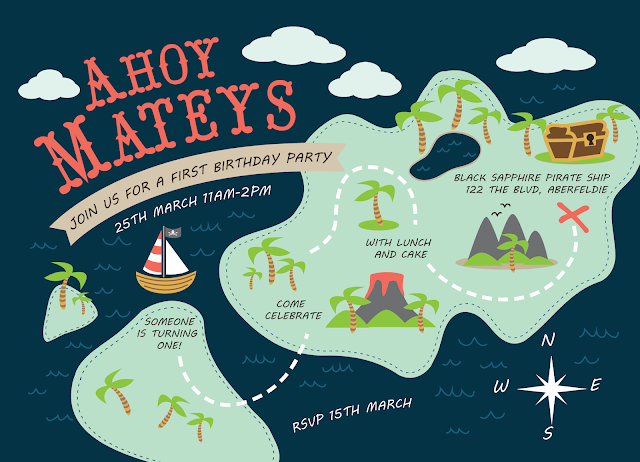 Digital invitations were sent out via SMS using the location as the party theme. We invited around 70 people and 65 attended. Everyone was punctual with their responses however I did make the RSVP ten days before the party so we could plan what we needed accordingly. If you don't fancy using the SMS option try GreenInvite or even a private Facebook event. We are very lucky to be surrounded by parks and bushland where we live. 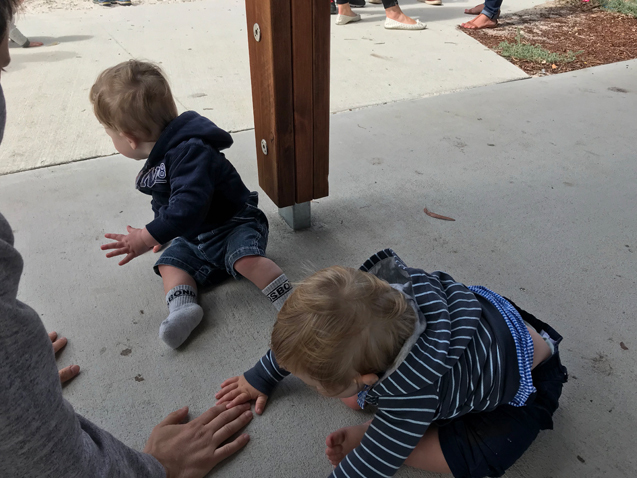 I decided to utilise one of the local parks to host our sons party as it had BBQ facilities, toilets, water fountains and a playground. 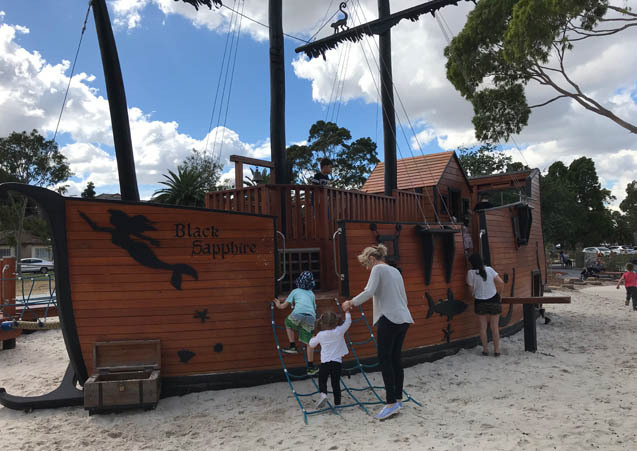 The Black Pearl Pirate Ship located on the Maribyrnong River in Aberfeldie provided the perfect backdrop and entertainment for free. Next to it was a pavilion with picnic tables and seats, meaning we didn't have to bring much from home apart from ourselves and the food. Being the tail end of summer, we crossed our fingers the weather would hold out. It did by an hour. We served popcorn, fruit, biscuits, small baked goods, 'sausage' rolls and 'cheesy'mite folls, followed by a falafel station with bread, dips and salad. Everything was easy to grab and vegan. The day ended with a homemade cake. It was the kind of food we wanted people to be able to eat while standing up and moving, because with younger kids adults are always rushing off making sure everything is OK and well, bigger kids are always moving. I didn't get any photos of the food, or many photos at all! My time was split between socialising and making sure nothing was flying away. Everything but the biscuits and cake were purchased pre-made and this is when we ended up with plastic, some obvious and some sneaky. The Lebanese bread used to eat the falafel with comes in plastic, but we did try to purchase without. The owner of the bakery told us that if we were to buy the bread without plastic it would dry out by lunch time. We cringed and went ahead. It was only three bags (we quartered the bread) but still the decision was agonised over. The plastic is a soft plastic that can be recycled (ahem, downcycled!) through the major supermarkets recycling programs. Three bread bag ties went into my waste bin. Our falafel and dip were bought in our own containers that we organised before the day. Nuts and popcorn came from local bulk food stores. We assembled a fruit platter but I think in the future we'll just serve watermelon as it was the only fruit devoured by everyone. The ingredients to make the biscuits and cake were purchased at the local bulk food stores too. My mother in law provided a salad to have with our falafels, and used tea towels instead of cling wrap. Now the sneaky plastic came from our small baked goods. I had intended to drop off reusable plastic containers to the bakery the day before but simply forgot. I wasn't to worried at the time since I had seen cardboard carry boxes. When we took the empty boxes home after the party I noticed the inside was shiny and I did the hot water test to see if there was a plastic coating. Sure enough there was. So I separated all the plastic (polyethylene) from the cardboard, took the plastic lining to the soft plastic drop off with the Lebanese bread bags and recycled the rest of the cardboard in our normal kerbside recycling bin. It was less than a handful of plastic but still, it was plastic and would have ended up in landfill during the recycling process. The Builder accidentally dropped the esky carrying the beer and wine, smashing two beer bottles on the footpath. These were swept up and put straight into the bin at the park. This is kind of funny because the effort I went to find second hand plastic plates and plastic drinking glasses was done so we wouldn't have to worry about any of the children breaking glass in a popular public location. Apart from beer and wine, there was a drinks dispenser from home full of lemonade, the same recipe from my book and used at our wedding. We had several glass bottles of water for guests to fill their cups up with too. We set up a recycling bin for bottles and a small compost bin for any scraps too. 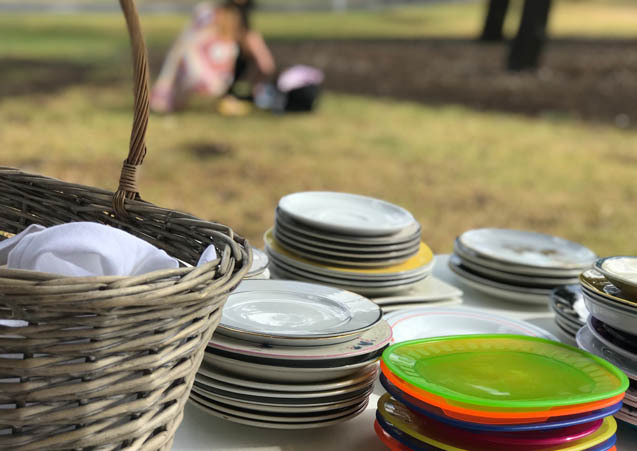 We had regular plates for the adults and plastic plates for the kids, along with plastic drinking cups and wine glasses for the adults. As mentioned above I was trying to be cautious in a public area. I had the crockery plates from previous events on hand, so all I had to do was find the plastic kids plates and drinking cups. Luckily Savers had more than enough. Actually, I don't know if it is really lucky...goes to show just how much second hand plastic there already is. We've decided to hold onto these for future parties and loan out for friends and family to use. If you are in the Western Suburbs of Melbourne, feel free to get in touch should you like to borrow anything. 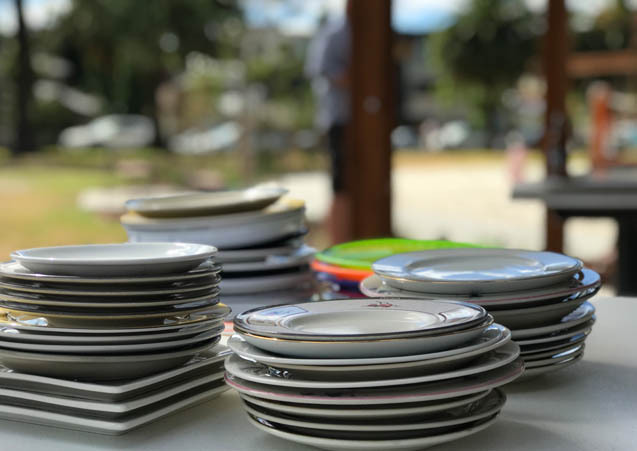 Extra serving platters and bowls were gathered from family and secondhand stores to. We used cotton napkins too. It was also a straw-free event but I did bring some of my metal ones from home just in case. I will admit we are lucky to have storage space in our home to keep a lot of these party specific items. 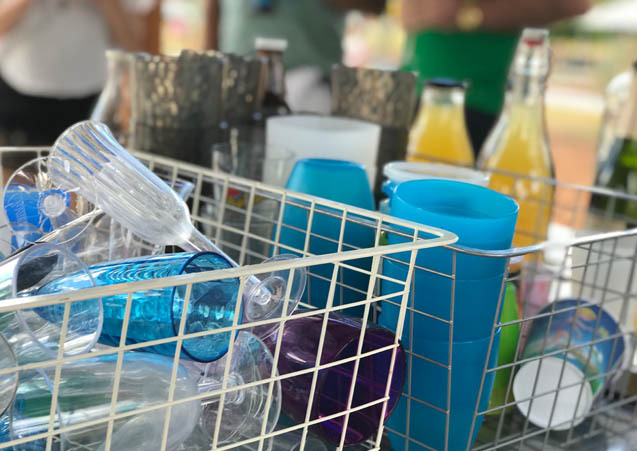 But we wouldn't hesitate to borrow everything instead of buy disposables. People are more helpful than we give them credit for so that's why I always encourage people to ask those around them to borrow and share. Otherwise buying from a secondhand store and returning is worth considering too as you can view it as a monetary donation while helping reduce waste. 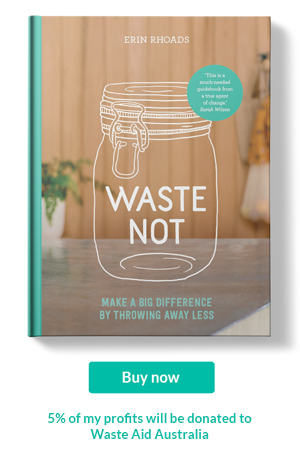 In my book I break down how I plan for parties to help reduce relying on disposables through to planning the food to be bought and cooked. Using a piece of paper, usually a scrap of paper from The Builders invoices, i'll draw a line creating two columns. The first column lists each dish to be served, with second column used to work out how many plates or serving platters I need. This helps me work out if I need to borrow or buy extra, and whatever is needed will go onto my shopping list. The day of the party was VERY windy and it turned out the pirate ship was located in the windiest spot along the river. The linen table cloths, bunting and fun pirate decorations I had collected stayed in the car. We had a hard enough time stopping the wind from blowing the food away! It was a calamity but I can laugh now at all the effort I put into decorations for them to not be seen. At least for this birthday. When you have a party outdoors everything is at mercy of mother nature. The pavilion next to ours was also hosting a party and they had balloons, single-use plastic cups and plates blowing around. It was hard to watch, especially being on the river. Another reason to avoid disposables. No party bags were handed out but we did encourage kids to take home as many cakes they wanted. We asked for no presents, but were aware some people would bring them. I've said before i'm not against presents, understanding people will bring them because some people are gift givers. And that's OK. Out of all our guests we received five presents, mainly champagne for us! But we were also happy to receive cuddles for our son. We kindly ask for presents, your presence and a cuddle with the birthday boy is enough. 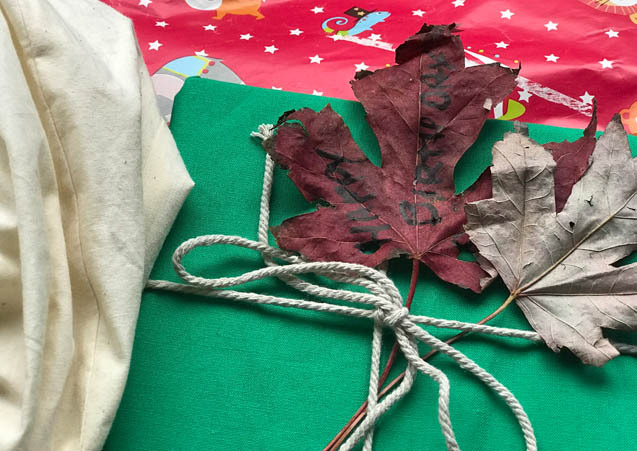 The gifts for our son were wrapped thoughtfully like this set of books in scraps of cloth and the leaves as the card and gift tag. Others wrapped gifts in old wrapping paper and even cloth bags. To be fair, everyone knows the lifestyle we live so we didn't have to ever bring up the subject of wrapping paper with anyone. If you'd like to but don't want to offend anyone, try sharing a blog post or an image from Pinterest to your personal Facebook page to help pass on the hint you are trying to reduce your plastic and rubbish. The party was easy to plan and this was because my son was turning one, so he had no say in what he wanted. Apart from the plastic, broken bottle and windy weather, it was a successful party. The party was also a learning experience, as are most things when we try them for the first time. We'll be better prepared for the next children's party which we might do when he turns 5. Hopefully my cake baking skills will improve by then and I can attempt a Woman's Weekly Birthday Cake. His 2nd birthday will be in the US visiting my family, and I'm excited for that. Our son was happy, enjoyed his cake and we got to celebrate making it through the first year with our family and friends. A big thanks to my mum and dad who helped us get everything ready for the day and especially my mum, who saved the day with the cake. 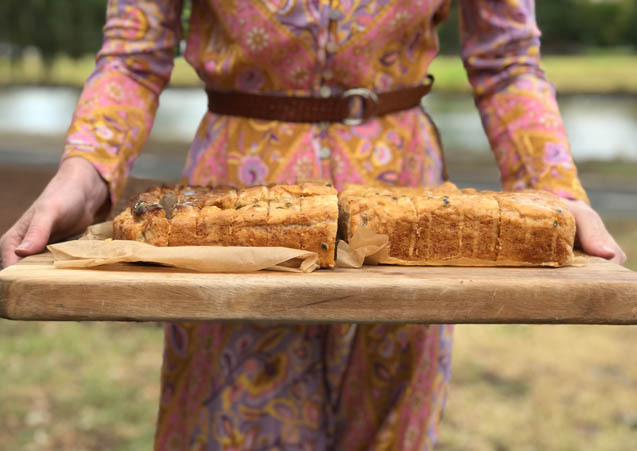 For anyone wondering, it was this banana cake recipe with a passionfruit glaze. The flour was substituted for a gluten free option and tasted great! Btw, if you are wondering where the photos of the actual birthday boy are, we made the decision to not put photos of his face up on any social media, my blog or into my book. At the moment we'd prefer to let him have the choice where and how his face is used, and right now he wouldn't understand if we asked for his approval. People and media publications take content and images from this site, often without asking. We just wouldn't feel comfortable if they did that with his photo, amongst some other reasons. A personal choice we've made :).